Meet Joanne Hanson-Halliwell, incredibly talented and passionate woman, with the best sense of humour (she is English after all! ), and founder of Small and Mighty Babies. All photography by Jules Seddon of Jewel Seddon Lifestyle Photography. In the short life of this blog (just over a year) I have always shared happy, fun stories. Until now I have never got emotional writing a blog post. But this is a different story, a different topic. One that life gave me a little taste of, and also I probably find more touching because I might have become more empathetic of other women's experiences and circumstances since becoming a mum (funny how this works, especially after having been a super competitive career girl in my previous life!). 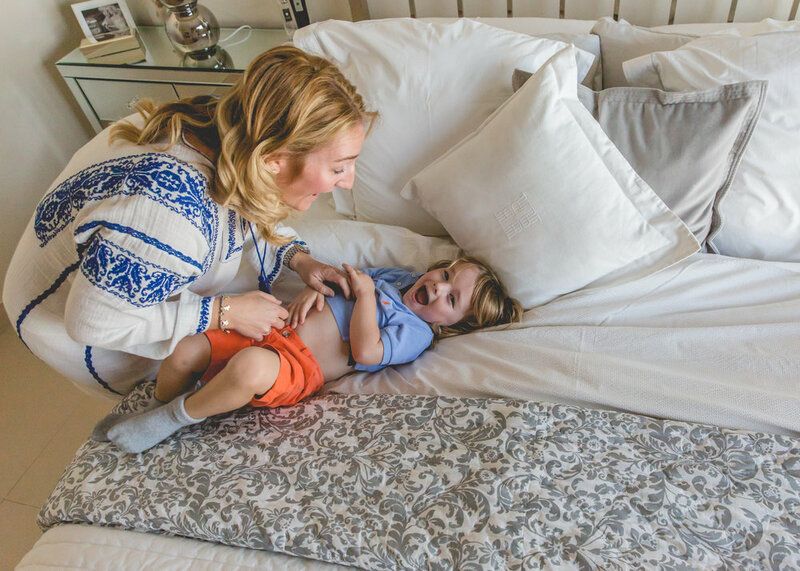 I know too well the heartache of going to the hospital to have a baby, only to come back home a few days later with everything we had eagerly and carefully researched and selected for the baby coming home, BUT the baby. What is for most parents one of the happiest days in their lives, driving back home excitedly to start life as a little family, for us was a trip filled with tears and our eyes fixed on the empty baby car seat. Despite the distress, we felt very fortunate as our firstborn made an entrance at 34.5 weeks of gestation and weighed a whole 2.5 kg, so was only a resident in the NICU for a few days. Other babies, though, are born far more prematurely, weighing only a few grams, and start their journey into this world enduring weeks and sometimes months in the NICU, at times involving surgery (or multiple surgeries), with their parents only allowed to see them through the side of the incubator. They are small, absolutely tiny in fact, but they are mighty and they are born fighters, and most of them pull through and live full, healthy, and happy lives. And then there is the heartbreaking story of those who sadly just never made it home (or did, but did not stay long enough). They were also born little fighters but despite everyone's efforts, sweat and tears, their tiny tiny bodies just were not strong enough to survive outside of their mum’s womb. 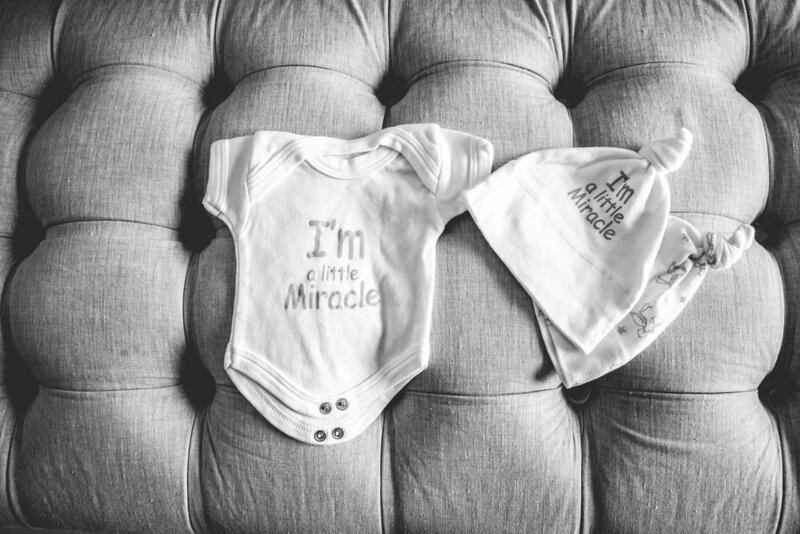 Before embarking on the exciting journey of mummyhood, Joanne Hanson-Halliwell was a banker whose life was turned upside down by the unexpected arrival of little George, 10 weeks early. So Joanne and George are no strangers to life in the NICU. That was a whole 3 years ago now but after her experience, she made it her quest to offer support and a shoulder to other parents facing the same unplanned start to parenthood, through sharing stories and the pain, and tears that every family that has or has had a baby in the NICU is too familiar with, and to connect families that have gone through it, as nobody else will understand their sorrow better. With this, her amazing group ‘Small and Mighty Babies’ was born. Joanne is one strong woman that can bring humour to any situation, and I really could not think of anyone better to carry a role like this one. She is completely passionate about this project and her smiley eyes just sparkle when she talks about it. Her work is so amazing that has won her the Time Out Dubai Special Recognition for Pre and Post Natal Care Award at a ceremony held at the Conrad Dubai earlier this month. A huge congratulations to Joanne - so, so, so well deserved! Do visit the Small and Mighty Babies website HERE. It is crammed with incredibly helpful information for parents of premie babies but also other parents, and links to other support groups. What do you love the most about Small and Mighty Babies? Being able to help other people and make what could be a horrific time in their life a little less painful. It has also helped me so much come to terms with what happened to me, became my own little therapy for myself and finally the support I receive gives me so much confidence to always continue and push forward with my support group. I am in the process of finalising a signature scent for the Small and Mighty candles, along with a jewellery range, incubator covers and we are working on a memory box for bereaved parents. Winning a Time Out Dubai Award for Special Recognition for Pre and Post Natal Care! It can be very hard sometimes to meet and make progress with some of the hospitals. I appreciate their priority is their patients but what Small and Mighty Babies can offer totally complements there business and I often get so frustrated when they won’t accept my business card because it doesn’t have their logo on. I am trying to help and support and every mother within the group always comments that talking with people who have been through the exact same as yourself is so helpful when it comes to beginning the healing process. I would love to expand Small and Mighty Babies to different locations outside of the Middle East. How do you balance your role as the founder of SMB and your family time? Like any working mother we all find this very hard. I use the morning when George is at nursery for meetings and admin I need to do and then often in the evenings after his bedtime to do more if I have the energy given afternoons are for chasing him around the house, park or beach! How did your life change after having George? In every way. I always say no woman is every ready for motherhood but when they are born early you definitely aren’t. I saw life before I was meant to. I saw very sick babies fight the biggest challenges you can imagine and come home and sadly, I saw those who lost their fights. I saw what they went through and I saw what their parents went through. Seeing these moments, the saddest and most painful moments anyone could go through changes you. I finally feel like I live and not just exist. I see the good in everything and not the bad and I make the best of everything. Id’ love to say patience here but sadly not – that’s work in progress. I think it’s taught me to live, to be open and to appreciate how lucky I am. What qualities do you want George to value? Hard work, fight for your dreams and always keep your feet on the ground. How are you planning to raise George so that he stays in touch with reality in the world of bling that Dubai can sometimes be? His playroom has a “grass carpet” which we call the “farm”. Our fridge is covered with family photos from the farm and when we Skype home my mum takes the iPad around the farm buildings to see the real world…however dirty it can be. My husband and I are both northerners and i think those values instilled in us are instilled in George. What are you doing to familiarise George with his British heritage in such a multicultural environment? A trip to one of the lovely beach clubs with diggers in hand…and a chilled Rose for me! It is honestly a brunch without a child. We rarely go to brunches and George has never been to one, a room full of noise, crowds and sugar is something I don’t want to pay for. Do you have any favourite toys brand for George? Le Toy Van when he was younger. JCB Diggers, John Deere Tractors and Bruder are all wonderful. Does George have any particular excuses he uses to delay bedtime? I’m very fortunate to have an excellent bedtime routine which he “obeys”. We often get the but I’ve not eaten all day excuse but its rare, he loves his bed and he loves his sleep…just like me! What has been the most valuable piece of parenting advice you have been given? Don’t Google it! If you have a question, ask an expert in that field. The Maldives does takes my breath away, it’s a time to really switch off and reboot with my husband. Ibiza with the girls, and the UK with George. So many to choose from, but I love Zighy Bay, pretending to be in what looks like the Flintstones set whilst ‘camping’ under the stars … ticks every box. My phone, Eve Lom Kiss Mix and a bottle of water. Jing Tea which I ship to the UAE from London, a regular hammam treatment at the Zabeel Saray and those little parcels that arrive from Net-a-Porter! I try to fit in classes at Physique 57 and go to the gym with a wonderful trainer Jes Body. She has the most eclectic energy that honestly lifts your body, mind and soul. It’s a full work-out with Jes, not just physical but also on your attitude. I miss training with her at the moment as I am using all my spare time for Small and Mighty, but when you know this girl she stays with you forever so at times I will just close my computer and go and skip (or try to!) in the garage! Marina Social at the InterContinental Dubai Marina. Bagatelle at the Fairmont Dubai … I have been home at 4am and up again at 6:30am with George, it was totally worth it! They say you don’t die thinking of all the good nights’ sleep you have had … I live by this. I am not a morning person so have to say, my own dining table. I love cooking and my husband says I do the best breakfast in town. Plus you can’t go around Dubai in your PJs!! If I’m up and about - Baker and Spice! I wish I did! Heat and children don’t go together so I try to be ‘cool’ – literally - with loose tops and tailored shorts. What do you love the most about living in Dubai? The convenience of everything (except the roads!). I feel so safe here, I love the culture and the mix of people that live here. Are you reading a particular book at the moment that you would like to recommend? Sadly not, I love Kinokuniya at the Dubai Mall and plan to visit again soon and buy some new books! If you were allowed to invite anyone at all to a dinner party, who would be your 3 top of the list guests? Nelson Mandela, Maya Angelou and Princess Diana. Photography by Jules Seddon of Jewel Seddon Lifestyle Photography. Jules is a family, maternity, newborn and event photographer currently based in Dubai. She specialises in lifestyle photography which mainly aims to capture portraits and people in situations, real-life events or milestones in a photojournalistic style. Her style is natural and relaxed; she likes to capture those candid moments so that you can look back and treasure those memories forever. She makes use of natural light in order to achieve soft, gorgeous portraits that feel genuine. Meet Deepika Gupta, a.k.a. Dee, founder and sole administrator of one the UAE's most popular Facebook mums support groups, Dubai Marina Mums. Photography by Jules Seddon, of Jewel Seddon Lifestyle Photography. I first came across the Dubai Marina Mums group some 5 years ago when I was a real rookie at this business of mummyhood and everything appeared so complex and daunting. So through playdates, mum events and lots of conversations on the page about the baby’s feeding and sleeping issues, solutions to nappy rashes, recommendations for best nurseries, birthday party venues and organisers, family friendly brunches, etc my first mummyhood friendships were formed in this lovely, supportive and caring community. 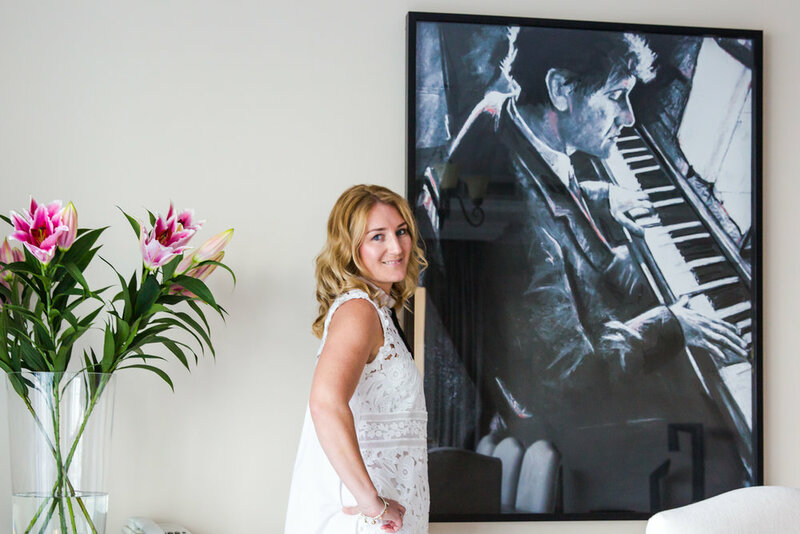 Dee has not only been the founder of the group, but also a true pillar in the community of mums in the Dubai Marina, as well as inspiration to others to create similar support groups. Being an expat comes with a lot of benefits but by the same token, also with the challenge of being away from home and our families, circle of lifetime friends, neighbours and so on that are so important when bringing up children - it takes a village and all that. And Dee has created the village in the Marina and by now, beyond the Marina as well! Prior to being 'Dee of Marina Mums', she and her siblings grew up as expat children in Australia and London, before moving back to India once their dad retired. Being no stranger to expat life, after marriage she followed her husband to Dubai and ended up making a community of her own! 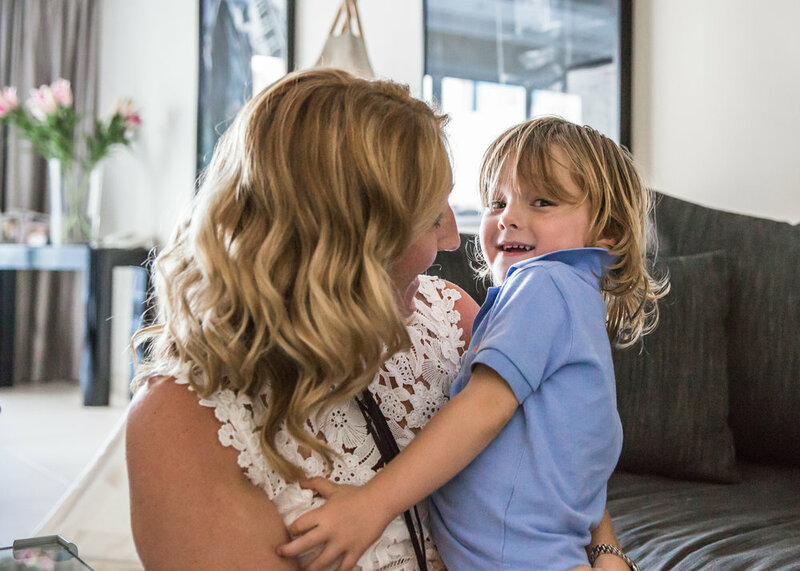 When she became a mum she had to give up her full-time job realising that without family or full-time child care she would have to own motherhood. 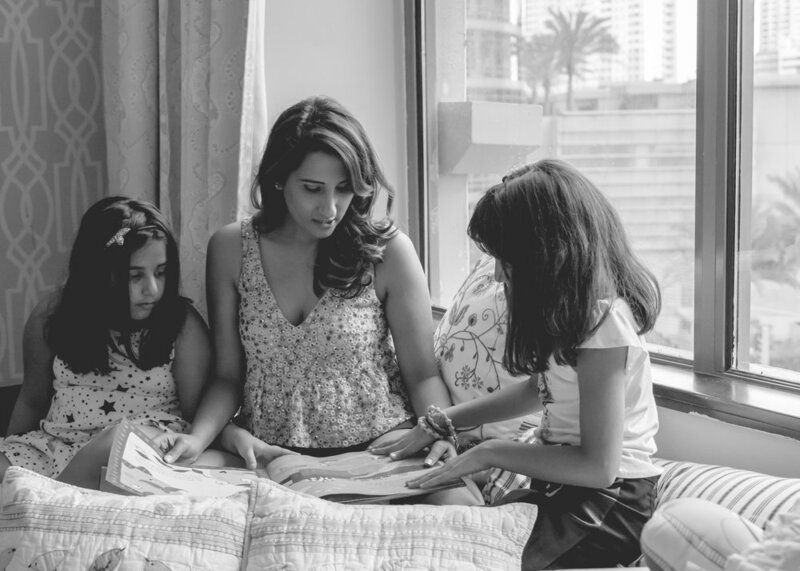 Starting Dubai Marina Mums was a seed she found missing as a new mum in a new city without a group of women supporting each other. So creating the group helped her bring the cool back to being a SAHM and removing the guilt from it. Dee welcomed us to her beautiful home where we had a few giggles while she played tea party with her girls, Saira who is 9, and Annika, 7. Oh ... and we also got to have some delicious Indian Chai! Her gorgeous duplex in JBR is oh-so airy and almost has a villa feel to it with the large spaces providing plenty of different areas for family rooms and for entertaining, and ... a bar that if my husband knew existed, would not stop nagging until he had a copy of in our house (pictures of the said bar were not taken on purpose, as I know he does read my posts). Their lovely terrace wraps around the apartment and has views of both the marina and the sea. Dee's home is a beautiful and rather eclectic blend of urban modern, Art Deco and shabby chic, with Indian accents and Zen elements like the numerous Buddhas that bring a sense of peace and calm to every space. When her girls host play dates they tend to end up in big dance-up sessions in front of the oversize mirror in the reception, perfect to burn off all their excess energy! Her house is also dotted with amazing family heirlooms: the most beautiful pieces of pure Indian silver in the dining room display cabinet, which include her grandmother's tea set and the most intricate bowls and jugs gifted to get by her in-laws (who obviously know how to make a girl happy! ); and in the guest room, in a beautifully framed setting that is worthy of a museum, her great grandmother's nose ring. Completely out of desperation to reach out and make some mummy friends! I saw the potential JBR had in the communal Plaza Level when we moved in. JBR experienced a baby boom back in 2006-2007 with new mums hanging out in the little gardens hidden behind the buildings, juggling conversation along with pushchairs and baby food. All of us, lost expats, converged on the JBR Plaza searching for a way to connect! Marina Mums started as a way to make my own little virtual village, the idea grew and numbers increased through word-of-mouth from 5 mums to 4,000 in 7 years! I don’t see it as a challenge now but in the early stages, when Marina Mums had just started, I used to host Thursday playdates at a little garden just by our apartment. The word started spreading and soon I ended up organising story-telling, music, and arts and crafts sessions for 50 kids each week! The mums would pitch in by bringing juice and snacks, helping with arts and crafts, and handling registrations. It became a home-grown play group with mums volunteering their time and talent to get the community together. Dubai Marina Mums has been my baby. I love setting up my laptop, with a big cup of coffee in hand, and give my time and energy to all the posts and queries I receive. I get more than 200 posts a day on the closed group. A mum has a query, we suggest, it then leads to a discussion and onto a solution… love the whole journey! It gives me a real buzz, especially when we help out mums who aren’t a part of the Marina, or may not even be in Dubai and are seeking info on moving to the city. Marina Mums as a forum has also demonstrated its power to make a social difference. In the past, we have successfully managed many grass-roots community initiatives, from helping Pakistani flood victims, to collecting and distributing 450 dental kits for children from the lower economical background with zero dental health in Delhi, to helping a fellow mum whose son had been diagnosed with cancer - all of these initiatives have led me to believe in ‘being the change you want to see’. Small baby steps that go a long way! For me personally it has meant getting away a little from the life of privilege in which we tend to lose ourselves in Dubai and reaching out and helping out! I would love to start a blog soon to store all the wealth of information shared on the group in a more structured fashion: blog posts about living in the amazing area of the Dubai Marina, featuring all the great services at our disposal. I would then like to keep the Facebook group mainly for support! What do you love the most about the Marina Mums group? The Mums!! It has been so successful mainly because of the involvement of the mums in the community – the ever active group members. The fact that a stranger would take the time to help another stranger, type words of encouragement, lend a hand, refer a doctor or share their experience always amazes me - all offering help because they have been in the same boat. It's simply fascinating! After so many years it runs like a well-oiled machine where I do not need to micro-manage the forum anymore. Some of my happiest memories, again, are of the playdates at the little garden behind my home - lots of ‘messy gooey play’, storytime with Dee and finger painting with 50 mums and kids. It was the base that led the community group to building a reputation beyond the Marina, everyone in ‘New Dubai’ was talking about it and pretty soon Time Out Dubai, Khaleej Times and Gulf News all wanted to feature us in their articles! It was one of the first times a community came together on such a large yet informal scale with social media as its foundation, and created such an active virtual support group. How do you balance your family time vs your time on Marina Mums? Multi-tasking and periodic ‘Phone Bans’. Mornings after school drop-off is my MM time, where I try to save the world (pun intended) with support! I have been able to give more of my time to the forum since both the girls are in full time school. Their pet peeve is seeing mummy on her phone so I try to keep the phone away on charge when it’s home time. I do sneak in a few peeks when I am on soccer mum duty, swimming lessons, drama classes and lots of waiting outside the classes. Glad it keeps me mentally busy! I have also been blessed with amazing house help, without whose support I would be drowning, plus amazing grandparents who are ready to fly to Dubai whenever I feel the kids and I need some TLC! How did your life change after having children? Step 2: Move to a community - JBR it was! This newfound motivation resulted in me having baby number 2 within 18 months of first becoming a mum. And I have been on a ‘Career Break’ ever since! What have you learnt from motherhood? Patience, patience and more patience - from raising babies to going past the terrible twos, settling them in school, now raising little pre-teens. But I am enjoying every bit of it, each with a new set of challenges! Did you take any parenting advice from your mum or have developed your own style? I tend to keep repeating the stuff my mum used to tell me while I was growing up. It felt very annoying then, but I’ve got my head around it now! My mum is known for her particular style of “Mummism”. A classic quote was “First Deserve, then Desire” any time I asked her to buy me something. LOL … I hear myself saying the exact thing to the girls now. I remember her being so relaxed and positive, whilst reining in three young independent girls in a society where the girl child was not (and still isn’t) celebrated. I respect her so much more now … more than ever! What do you wish for your girls? For them to grow into content, compassionate young women and always remind themselves of their self-worth! Raised in this beautiful community with such a mix of cultures and values, I wish for them to always remember where they come from and to be open to the world! And yes, as a mum I want to help shape their personalities - guide them towards an alternate way of thinking (away from stereotypes) with young impressionable minds especially in an age of sexually stereotyping young girls, I like steering them towards a more gender neutral path! How do you get your girls to stay in touch with reality whilst they grow up as Dubai expat kids? Frequent visits to the homeland (India) sort them out for a few months. We support a few charities back home; also the first hand experience of giving and sharing is something the girls are blessed to be doing whenever we visit! Oh yes, and lots of house work; they are in the phase where they love helping mummy out. I do hope that stays on till they are teenagers! What is your favourite activity with your girls? Going to the beach! I feel blessed to be living 60 seconds away from one of Dubai’s most fabulous beaches. We just stroll down, hire one of the day beds and camp there for the afternoon. Option 2 is Marina Mall. My children love visiting the bookstore or getting a sparkly treat from one of the fashion stores! When at home, we love lots and lots of cuddles, Tickle-monster and story time!! We behave like a bunch of cubs when it’s tickle time!! Hmmm … we are not much of a brunchy family but the weekends generally do involve eating out. We have tick-marked and family-reviewed most of the restaurants on JBR The Walk, and Eggspectation seems to be a firm favourite so far! What advice would you give to Dubai newcomers or new mums who would like to make mum friends? Reach out! Don’t hesitate to reach out and get yourself out there! What fashion style best describes you? Casual chic - ripped jeans and white tee! For school runs, active wear. Your 3 essentials in life? Right now, in this phase of life: COFFEE - lots of it! WiFi and Yoga (I practise 4 times a week). Oh, and also reading - I love my books! A good book can give me the biggest high! Hmmm ... without sounding pretentious or too materialistic: my diamonds, my Rolex and Chanel! Going to Le Pain Quotidien at the Dubai Marina Mall is a weekly family affair on Saturdays. Anywhere down by the beach!! Our favourites come in phases. We have a fave for a few weeks and then we move on! Right now it’s The Maine Oyster Bar & Grill at the Double Tree by Hilton on Jumeirah Beach; love the vibe in that place and another reason we love going back is because everyone there knows us by now! Favourite spot for a girlies night out? We are spoilt for choice, living in the Marina! I am loving the new places on offer at JBR, although I might be a bit of a rebel sometimes and will meet my girlie friends half-way across Sheikh Zayed Road!! England. Both my sisters live there and I love spending our summers with the whole family gathered together there. Destination number two would be Kenya with its safari around the Masai Mara. We went once and haven’t been able to get that holiday out of our heads, so we’re planning to go back in summer 2017! Favourite short getaway in the UAE? Eventhough living by the beach feels like being on holiday already, we do love our sporadic weekend breaks at the Banyan Tree in Ras Al Khaimah where we have been 3 times in the last 5 years. We also went recently to The Cove Rotana Resort RAK and were pleasantly surprised! Favourite short getaway from the UAE? India. So much to do there for the Easter break: we have booked a white water rafting tour by the foothills of the Himalayas, we have been to the back waters in the South of India, skiing up North in Kashmir, chilling on the beaches of Goa and taking it all in at the palaces of Rajasthan. It’s a world in itself! I recently finished 'All the Light We Cannot See' by Anthony Doerr and couldn’t stop thinking about the story for 2 weeks! Right now I am reading ‘Americanah’ by Nigerian author Chimamanda Ngozi Adichie, which is a very powerful story about race and identity. What do you love the most about living in the Marina? The outdoor living, proximity to everything, the festivals on our doorstep, and the pedestrian lifestyle. All the traffic we have to face on a daily basis is absolutely worth it! And at weekend, we just have a strict 'no car' policy in our family! Although we stayed in Dubai over the Eid Al Adha school break, we have been busy keeping the Little Sybarites busy! And the highlight has most definitely been The Green Planet Dubai. It's the talk of town, and it's not for nothing. Done in true Dubai style, The Green Planet illustrates the biodiversity of our precious Amazon, by recreating an indoor tropical rainforest which includes the largest man-made life-sustaining tree in the world and over 3,000 species of its gorgeous flora and fauna. We saw emerald tree boas, toco toucans, Goliath tarantulas, Atlas beetles, giant green grasshoppers, tailed porcupines, huge colonies of ants, poison dart frogs, rows of chrysalis at work and the star of the show: THE sloth who apparently has a more discreet sibling that was napping somewhere else in the dome. If you are looking for more information, or for ideas on things to do with the kids while it is still a little too balmy for the great outdoor in Dubai, click HERE. So here we are... In Dubai with no school for nine days. My kids can never get enough of the Dubai Aquarium and Underwater Zoo, and I will not object. I find it soothes them and they always learn something new and exciting (did you know that octopuses have 3 hearts, 9 brains and blue blood?!). If you are all up for supporting worldwide charity, pair the visit with a stopover at the Discovery Channel Arabia. Brand new (opened on 1 September), The Green Planet is an indoor ecosystem with over 3,000 plants and animals dedicated to raising awareness of the fragility of nature in the rainforest, by replicating it under this very angular and funky structure in City Walk. Just up our street! The perfect spot to meet parrots in all the rainbow colours, the fascinating sloths, all sorts of lizards, and the more scary Goliath tarantulas. We had been meaning to try this amazing play centre all summer but finally did when we were invited to a birthday party, and now … we are addicted! Make sure you go with enough time though. A rushed visit is not a good idea, as the kids will find all their friends from Bob the Builder, to Barney, to Fireman Sam, to Angelina Ballerina, and Thomas and Friends. There are dress-up costumes in every station and plenty of opportunity for imaginative play. We love the top floor as well with a huge library to take a break from all the action and snuggle up reading a book or two, and the star was the drumming set that my son just couldn’t get enough of. The staff were so super lovely: friendly, attentive and at hand at all times. 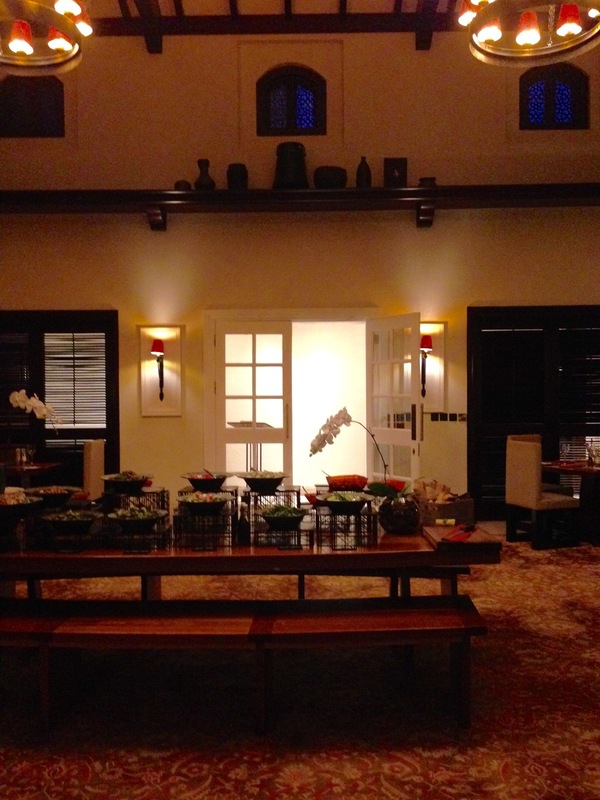 In a villa setting tucked away in Al Safa (but do not let it put you off: it’s huge! ), after having visited in early summer, we found this fab waterpark perfect to keep kids of ages 2 up to 10 cool in the hot months of the year. There are plenty of slides, water tunnels and splash pads to keep both my 2-year old, her 5-year old sibling and his buddies buzzing with excitement for hours. The little café is perfect for an early dinner before heading back home, with fresh fruit juices and healthy kiddie bites, but I did have BOTH kids pass out in the back seat before I made it to the first set of traffic lights! As soon as it started showing in the UAE, we decided to have our very first expedition to the cinema as a whole family. It is not often that I can say this but it was an absolute success! We chose Reel cinema in Dubai Marina Mall because we love how it is small and cosy, perfect for the little people. Age-appropriate, with beautiful animation and super funny, it kept both our children quiet and with their eyes peeled on the screen for the entire movie (OK, with the help of pop corn). If your kids like The Minions series and The Lorax they will love this movie, produced by the same team. More information on https://uae.voxcinemas.com and www.reelcinemas.ae. 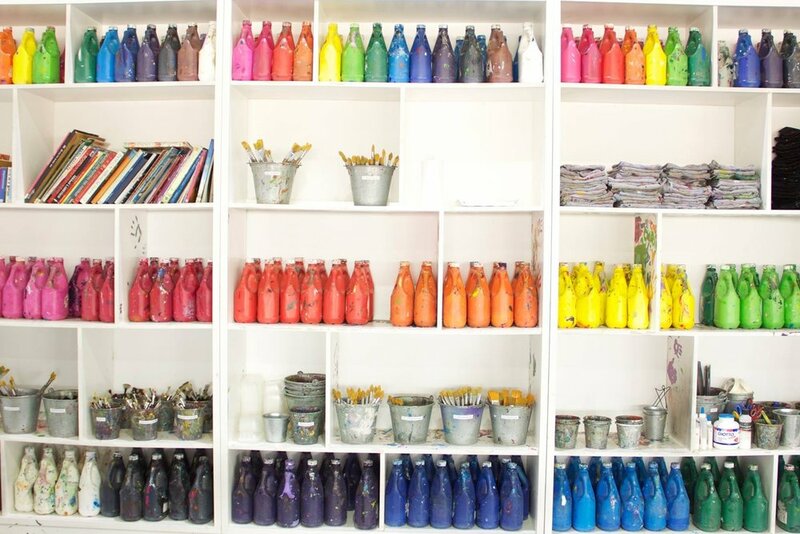 Have a whole family creative session at the jamjar Studio. You can use the Public DYI Painting Studio where there is also a coffee bar to keep mummy’s and daddy’s creative juices flowing, while the little Picasso’s will find inspiration in the music. Their 2-hour package is perfect for families and includes all painting supplies and easels. Opening hours: Opening hours: Monday to Saturday 10am to 8pm, except Friday 2pm to 8pm. Sunday closed. The kids may not have school to wear them out, but see what happens after one hour of ‘flipping’! Trampolines are all the craze at the moment and this new centre in Al Quoz (of Australian origin) is the largest in the Middle East and has all the elements that my little tribe will just love. If you have Little Flippers, you won’t be allowed to join them but you can watch them from the cafeteria while they are assisted by marshals. Where: near Noor Bank Metro station in Al Quoz 3, and next to Speedex. To access, when driving northbound on Sheikh Zayed Road, take the second service road after the Al Manara exit. My husband did their Grill-on-with-Weber session some time ago with a group of his friends (why BBQ and men go together will remain one of those mysteries of the universe). As an Australian, he wanted to polish his show-off skills and he was pretty impressed with their class - not an easy feat!. 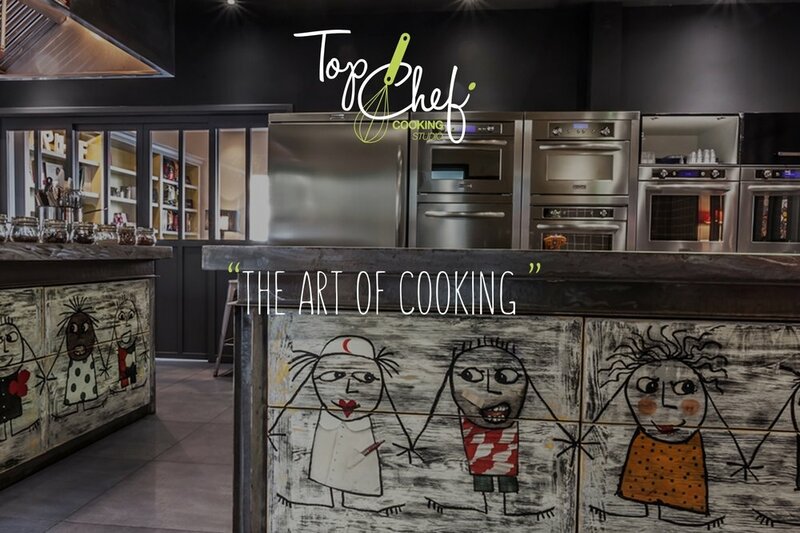 Our children are little gourmets but are still a little young, as Top Chef only caters for kids aged 7 to 12, but it is on my Bucket List for them as soon as they are old enough. Like with all cooking classes, they also get to eat their own three-course creations – bonus! Click on here for this month’s menu. When: Mini Chef sessions are from 4pm to 5:30pm on scheduled days. During this school break they are on Saturday 10, Wednesday 14, Thursday 15 and Saturday 17 September. It is still a little sweaty to go to outdoor playgrounds but you can still let the kiddies go physical at Adventure Zone with plenty of facilities and structures to work on their climbing ability, balance and problem solving, all very professionally controlled and monitored, and with the full safety measures. They have a Cable Climbing Course, a Low Ropes Course which is only 50cm off the ground for the youngest, and 12 themed fun walls for climbing that go from dinosaur skeleton to a castle façade and even a quiz wall that will only allow you to carry on climbing once you have answered the questions correctly. A height restriction of a minimum 90cm applies for all 3, and and also a minimum weight of 13 to 15 kg depending on the activity. And with this I would like to wish an Eid Mubarak to All of You celebrating, and to Everyone, happy 9 days of NO school! 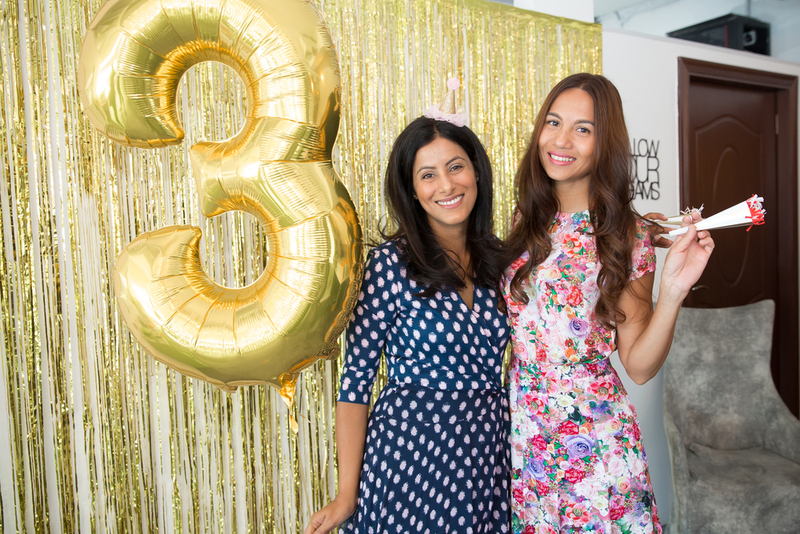 When Aisha Leitner, founder of Party Camel, asked me to stop over at their studio if I was free for a little coffee celebration on the third birthday of the brand, I knew it was not going to be just that. Being one of Dubai's party guru's she is incredibly stylish and is hugely creative too. You only need to look through her online store and her blog - it oozes cuteness and edge! So I made sure I got our errands over and done with very quickly that morning so that I could join, even if only for a short while. What I did miss though, was taking my camera with me! So a big Thank You to Aisha for sharing the pictures taken by The Studio. - Party supplies: Party Camel. Head over to their website here for the Happy Birthday Mini Party Hats, the Be Happy Bird toppers, the Photo Booth Props or backdrop, the Happy Birthday Plates or the adorable Happy Birthday Bags. - Pallets for the food display: Cheeky Little Events. Check their website here for the contact details to rent more equipment, arrange entertainment or just organise the entire party for you. - Photography: The Studio. 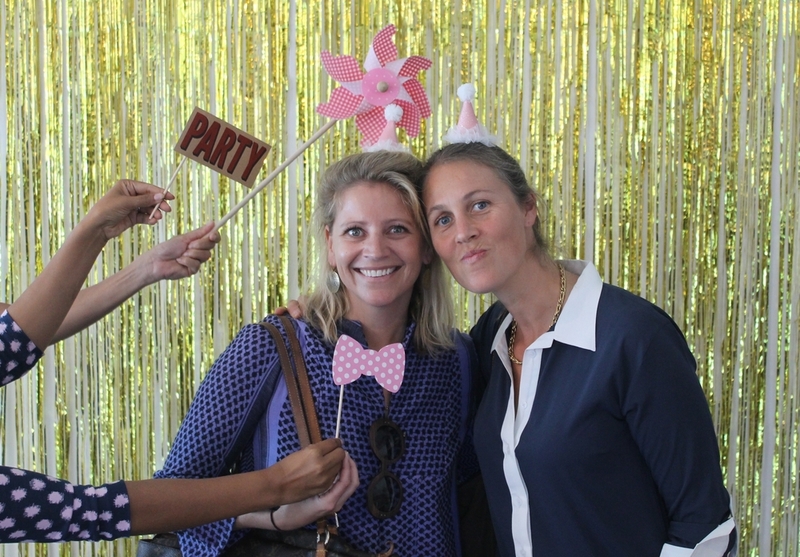 Do check their website here for their different options on the Photo Booth, including the cool Selfie Box. - Catering: The Lime Tree Cafe. My 2-year old daughter was very quick to decide the mini carrot cakes were going to be her lunch! 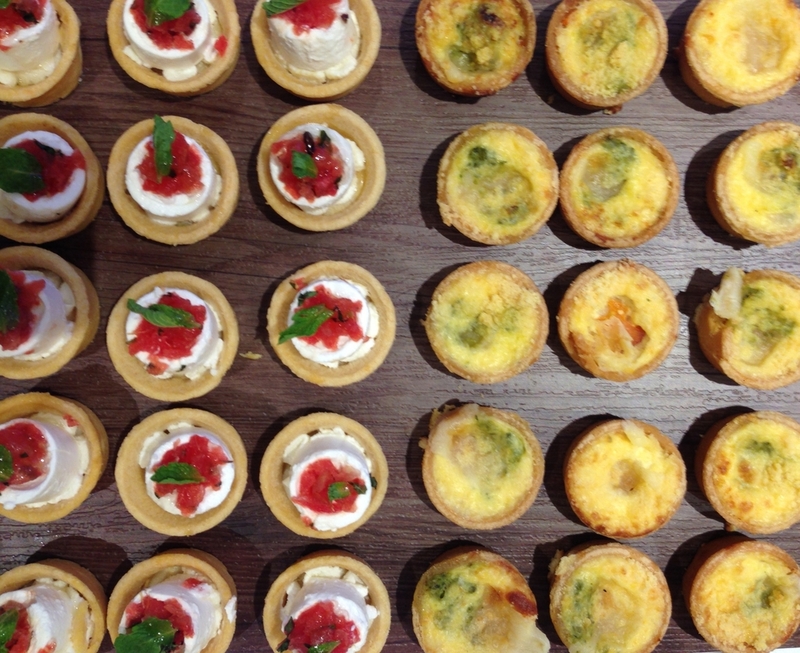 Have a look at their samples menus for Party Food & Canapés, or Kids Party Food. - Cake: Rasha Rmeily. Sugar perfection! If in doubt, scroll through her Instagram. - Illustrations: Samar Sadik Fashion & Lifestyle Illustrator. Nothing like one of a kind invites or customised favours to add a touch of class to a celebration. Have a look at Samar's work here. 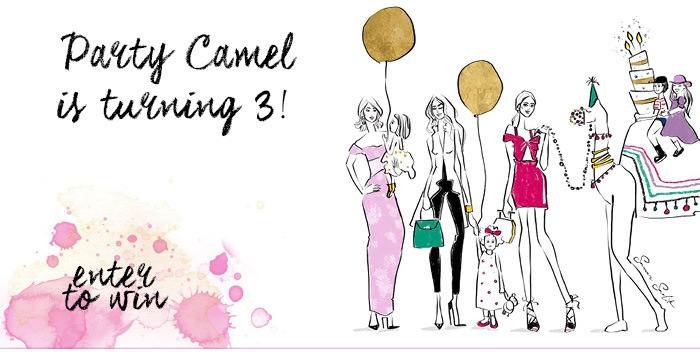 Now: Party Camel has a celebratory competition at the moment for a very special give-away: YOUR DREAM PARTY PACK! Click here to find out more - still a couple more days left to enter! Caramel & Sun - Current Happenings! Lots happening at the moment Chez Caramel & Sun, the gorgeous little concept store at Mercato Mall on the Jumeirah Beach Road! Have you visited yet? 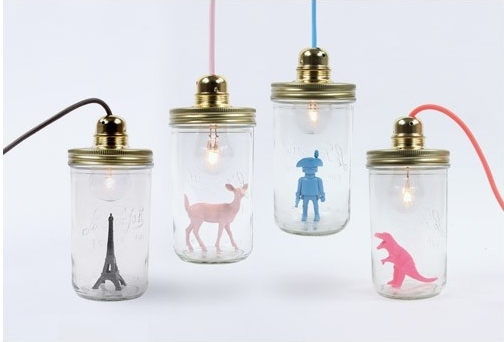 Run by two super fun French mums, Olivia and Magali, and also conceptualised by them jointly with dad-to-be Paul, it is crammed with the latest and trendiest children's room decor and accessories, brought straight from Europe and Australia - all hand-picked and lots of fun. It opened last September and by now they just seem to be the talk of town! 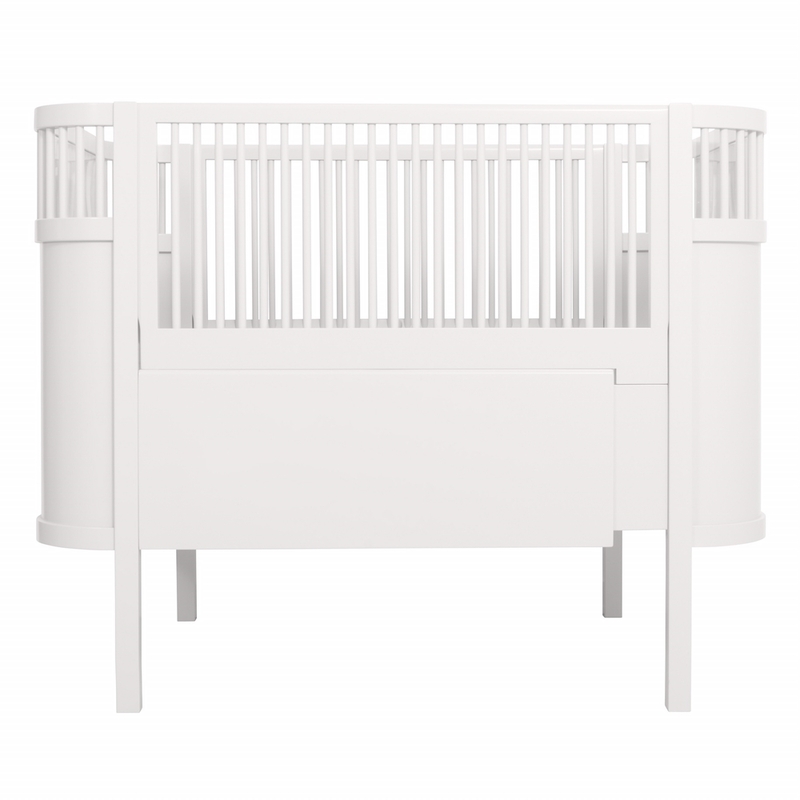 Click through the gallery to see some of their quirky, high end pieces like the retro Roulotte bed from Laurette, the cabinets from This is Dutch, the animal wall head pieces from Wild & Soft, the teepees and cushions from Nobodinoz, the non-toxic stackable Playon Crayons, the gorgeous cloud lights from Fromage La Rue and more night lights and light boxes from A Little Lovely Company, that I am just obsessed with, among dozens of others that Caramel & Sun feature. Their stock is limited so if you do like something, grab it before it's gone. But if you miss out on it, it will surely be replaced with something equally gorgeous and fun. Omy colouring placemats and Omy colouring wall atlas - with the indoor brunching season in full swing in Dubai and the Gulf now, colouring placemats just seem to be the perfect answer for dining out with the kids, and the atlas is an absolute must for the kids' playroom! La Tête Dans le Bocal lamps - as cool as lamps get! Get a free Eames replica table and 2 chairs, when you purchase any items from Laurette or This is Dutch for a value or AED 2,000 or more. Valid until end of May, so you have one more week to grab this offer! Caramel & Sun are hosting the Summer Kids Pop-Up Event at their offices on 2 June at their offices in the LPG warehouse in Al Quoz 3, the trendy and artistic hub of Dubai at the moment. Some of my favourite mummy and kids brands like Keenbags, Twins, Little Farasha, POMME, Dumye Dolls, and Mitera Collection will all there from 10am to 5pm. A real treat not to be missed! You will also be able to find them until the end of the season at my beloved Marina Souq, at the Fishing Harbour in Umm Suqeim 2, and every Saturday during the summer at the Ripe market in Times Square. Infused waters have been used in spas for ages and are the hype of the moment - it's not for nothing. Plus it is officially summer in the UAE and the rest of Arabia, so what a better way of combating the heat. For my daughter's second birthday party, we had a small garden affair for which I made a dispenserful of infused water with lemon, cucumber and basil. It was lovely to start with but by the time the guests arrived, it was too bitter. So since then I have done a little research and have been trying different recipes, and I must say I have got quite addicted to the thing, and so are the kids (plus it stops them from asking for juice multiple times a day!). We all know the goodness that comes with drinking our 2 litres (or more!) of water each day: hydration, detoxification and increased energy. Some argue it also helps slimming but that is not my field of expertise, so I won't go there. But drinking such a large quantity of something that is so plain needs some motivation, and I have found that the infused waters have that extra oomph that makes it happen with the ever so delicate flavours that its ingredients give it. Plus it is a fab way to get those nutrients of the fruits and herbs while you hydrate yourself. For me it also helps reduce my coffee intake (yes, I am bit of a coffee-holic) and I am less inclined to pour myself that glass of vino come 5 o'clock. Citrus: throw in orange, lime, lemon, and mandarin if in season. Super zesty and refreshing, and loaded with vitamin C. Best if you can get organic or unwaxed citrus. Berries and basil: the antioxidant water. Try strawberries, blueberries and basil. If you like raspberries and blackberries, add those too. After some infusing, you will notice how the the water turns a lovely blush colour. Pear and ginger: it makes a delicious mix with the sweetness of the pear and the zing of the ginger. Cucumber, kiwi and mint: also called spa water because of the cucumber, that can be used in endless combinations. Watermelon and rosemary: super refreshing, so perfect for the summer! The watermelon should be peeled of its rind. If you feel creative, scoop the watermelon into balls for an extra pretty water. I find a good ratio for a delicate yet interesting enough flavour, is 1 cup of fruit and 1-2 springs of herbs for every 2 litres of water. If you prefer a more intense flavour, simply add more to suit your taste. Once in the glass container, do press the fruit gently with a muddler or a wooden spoon to release the oils and juices. Cut hard fruits into thin slices to get the most flavour. Soft fruits can be cut either way (thin or thick, chunks, halved, quartered, etc) as they tend to release the flavour much faster. When infusing citrus with the rind on, remove the fruit after 4 hours to avoid the water turning bitter. If you are planning to refill, replace with new fruit. The ingredients that flavour the water fastest and so need least infusion time, are citrus, pear, watermelon, cucumber, melon and mint. The ingredients that need the most infusion time (overnight) are the hardest: rosemary, apples, cinnamon and ginger. You will notice that the some fruits will become waterlogged and will start to break down quite fast (normally soft fruits). So you can either replace with fresh bits of fruit or remove altogether. If you are not drinking the infused water within 24 hours, remove the fruits and keep refrigerated, consuming it within 3 days. So there you go! There's my dissertation on infused waters. Now off you go, experiment and be creative! I would love to hear which ones are your 'mostest favourites'. We all know the feeling: starting to look really pregnant and, this time quite literally, nothing to wear unless you don't mind looking like a tent … never mind those invites to elegant affairs! Well, chic Parisian-inspired maternity label Séraphine has finally landed in Dubai, adding to the global portfolio of this brand already present in cities like New York, Hong Kong, Paris and London. If you visit their store in Dubai Festival City which happens to be their largest flagship store with 2,500 sq ft, not only will you be treated like royalty and celebrities alike, but you will also be able to select the very outfits that style icons like Catherine Duchess of Cambridge, Princess Victoria of Sweden, Mila Kunis, Halle Berry, Jessica Alba, Angelina Jolie, Sophie Ellis-Bextor, Karolina Kurkova and Sienna Miller to name but a few, would wear while pregnant. The brand is not a favourite amongst the royals and glitterati for nothing: Cécile Reinaud, a Parisian herself and the brand’s founder and designer (amongst many other achievements and accolades), has an eye for creating sophisticated, yet easy-to-wear designs that see mums-to-be from trimester to trimester in comfort while looking super stylish. I love the versatility of the brand: work dresses, maxi dresses, maternity jeans (even the ripped skinny variety! ), knitwear, lingerie, swimwear, etc Not to be missed is Séraphine Deluxe, a line of the most gorgeous dresses for special occasions AND a range of luxury babywear, The Diana Collection, where 12% of the sale price of every piece goes to supporting The Diana Award, a charity set up in memory of the Princess of Wales. So it was our son’s birthday last week and to celebrate, we had a rather impromptu dinner at the Dubai Polo Club (or Dubai Polo & Equestrian Club if you want to be more formal), because it is in the neighbourhood and that meant we did not have to battle traffic to get back home to get the littlies in bed. The South African Food and Beverage Manager recommended The Backyard Grill, or Braai, at Palermo and we settled for it because it is casual, ready at 6:30pm and we could enjoy one of the last few evenings of the season dining al fresco. Bingo! It was absolutely fabulous! Even by my Australian husband's ‘I-know-all-there-is-to-know-about-barbecues’ standard. There is a buffet with a good choice of salads (both classic and creative) and pickles, and a small selection of warm vegetables including corn on the cob, jacket potatoes and roasted vegetables, while the meat and fish are cooked a la minute at the barbeque outside which produces spectacularly tender, moist and flavourful grills. The view of the polo field is oh-so-serene, and the children indulged in some horse sighting (a favourite animal in the family by tradition). Even a picky exhotelier like yours truly found the service flawless and always there, yet discreet, while they also were amazing with the children. The added bonus is their great playground that we have used in the past, but this time we tried and keep the kids away from, so that they would finish their dinner. 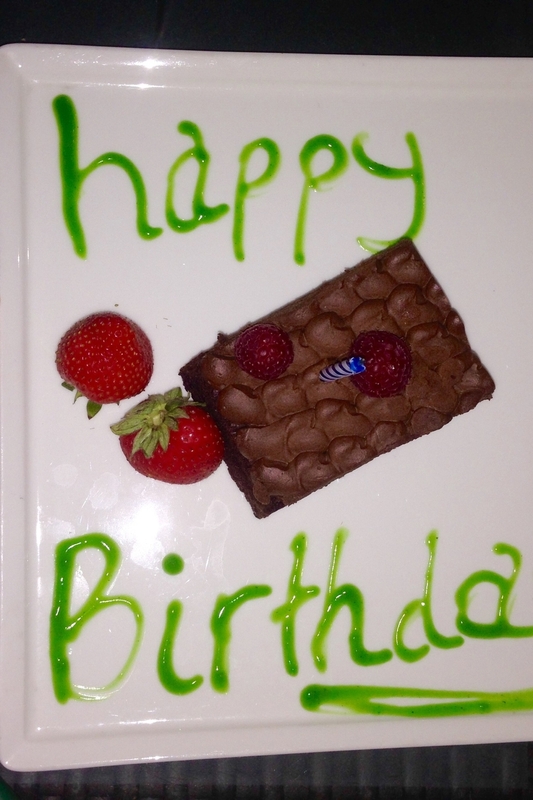 A birthday cake was improvised by the brilliant kitchen and service staff at no notice, and Little Mr Sybarite was chuffed to bits that he had an entire chocolate 'birthday cake' to himself for his birthday. We will most definitely return, next time on a Thursday to try their cheese vault and Raclette! I can safely say that Palermo has made it to my list of Dubai hidden gems, especially for those of us living ‘out here in the middle of the desert’. The Backyard Grill runs every evening from Monday to Saturday, from 6:30pm until 10:30pm. Have you heard of the Picture People? It is a family photography studio already operating very successfully in the USA, and launched in the UAE (first franchise outside the USA) by Emirati entrepreneur brothers Abdulla and Hamad Al Shirawi. Why are they different? Because they are as creative as it gets, and you get to take your final images with you on the day of the photoshoot! Personally, I find that after the build up of all that excitement leading to a photoshoot, I get very impatient during a post-event wait. Of course, I do love to get to see the sneak previews but I really want to see it all straight away! So this is exactly what Picture People do, they produce the digitals and prints on the day. 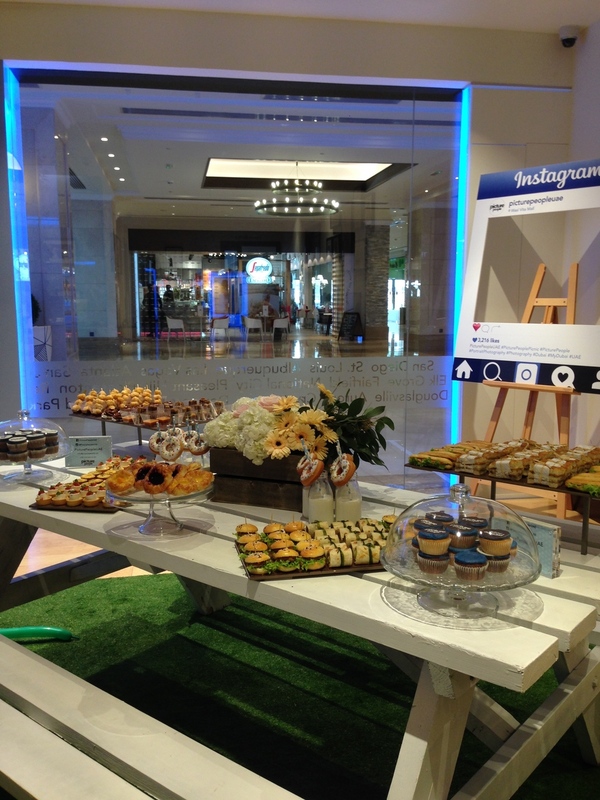 Recently they hosted an adorable event at their studio in Wasl Vita Mall on Al Wasl Road to officially launch the brand in the UAE although they had opened in September. Themed as a Garden Picnic, thought was given to every little detail - from fabulous hairstylists from eideal, to absolute deliciousness from The White Boutique, and none other than Magic Phil to keep the littlies entertained. And you will probably notice the garden too, just like I did. Would you like to know who did it? The highly talented and creative team at Picture People themselves! And you will probably notice the garden too, just like I did. Would you like to know who did it? The highly talented and creative team at Picture People themselves! 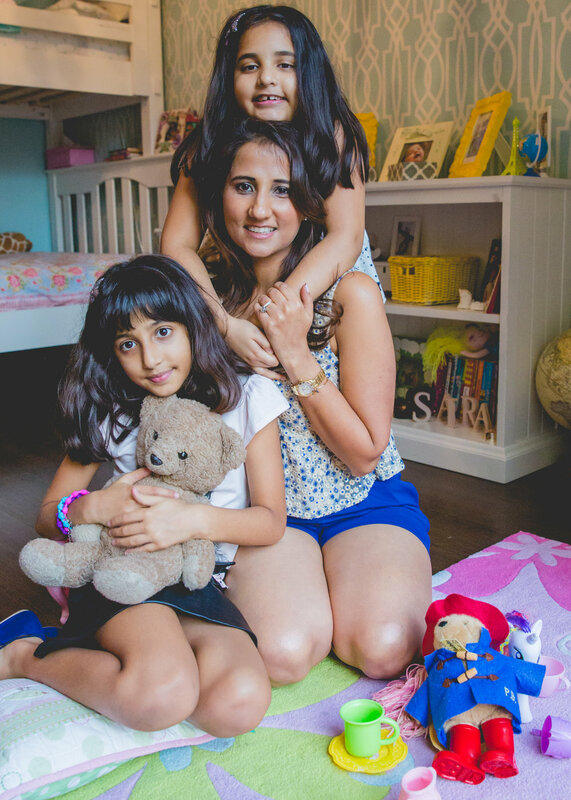 With the UAE Mothers Day approaching, they also gave us the opportunity to have a mini ‘Mummy and Me’ photoshoot and this is the outcome: fresh and fun! My little Missie knows how to put up a challenge and did her very best to test the patience and humour of the ever so charming photographer who just knew how to motivate her! This is the proposal from the Picture People for this Easter: do something different and have an ‘Egg Smash’, inspired by the ‘Cake Smash’! 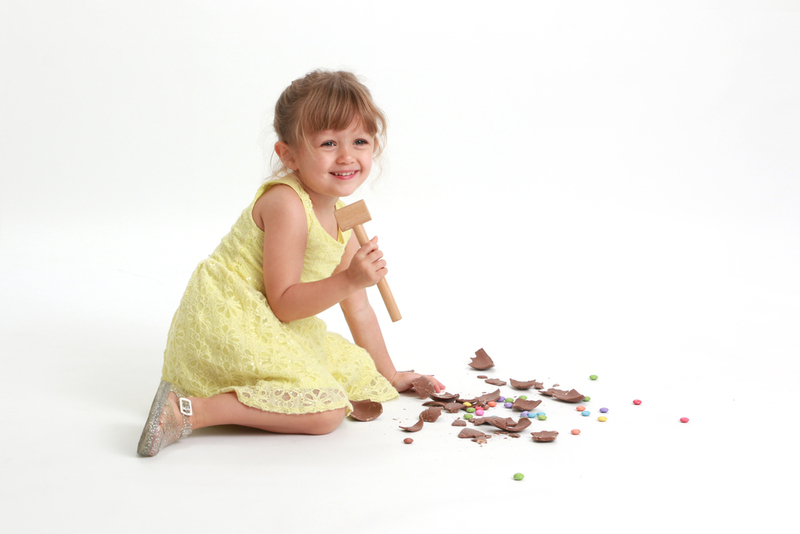 Priced at AED 495, the package includes a studio session using a chocolate egg filled with colourful smarties which your child or children can proceed to smash, shatter, break, demolish and destroy as they wish whilst the photographer captures all the fun and the huge smiles. With it, you then get to choose one image to be printed and framed on 4x6 format, and one ‘View & Share’ image. Additional to the package, you can also have the Egg Smash video filmed or you can choose further images for extra prints and canvases. Offer is valid until 29 March, so hurry! 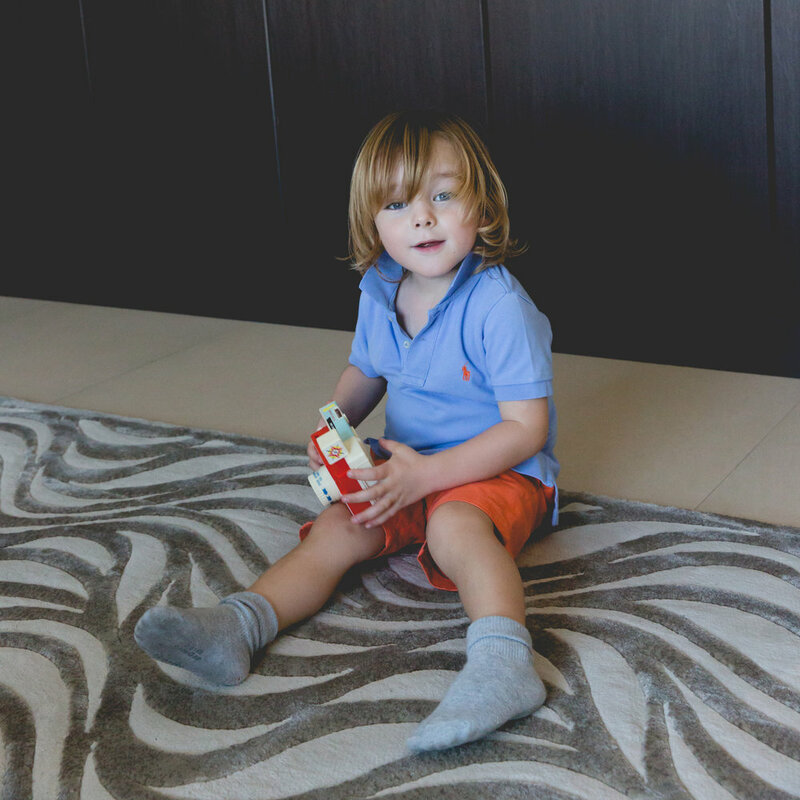 We moved from our beloved Dubai Marina into a new villa in the summer and decided to have a dedicated playroom for the children to play at their own content, where they could read books, play for hours and that would give them the right environment to be creative when doing their arts and crafts. It is almost complete now, but it is one of those rooms that a lot of times parents do not really know how to tackle and just ends up being a room with lots toys in it. A designated space in your home that kids can call their own is the ultimate enjoyment for a playroom. 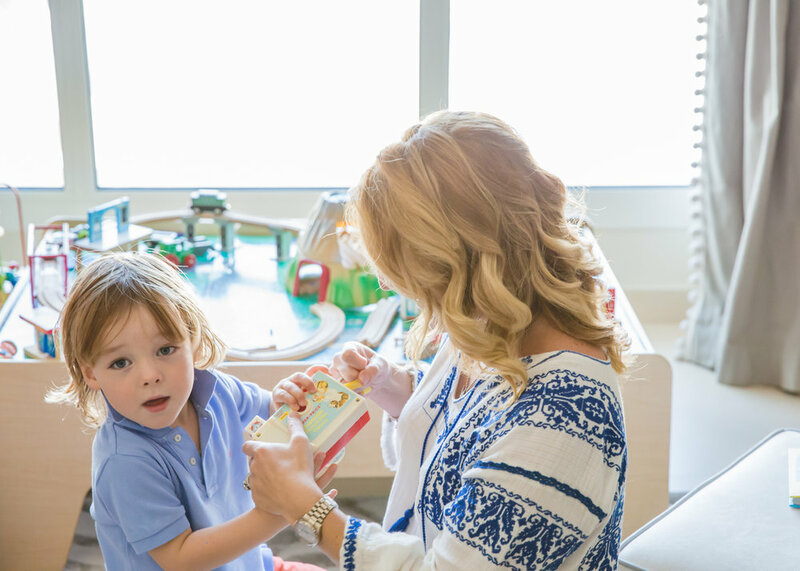 From the toys, to the unlimited supply of interactive games and supplies, the playroom is a sanctuary for kids! You can definitely go all out with the design, as there are so many amazing design inspirations, however if you follow a few basic steps, by including the standard items required you can really design the most beautiful play area which are functional as well as practical. Open Floor Area: Provide an area where they can spread out toys, roll around and have fun. Place an area carpet in this area and house larger toys adjacent in a closet where there is easy access. Reading Area: This area can consist of a small table, chairs next to bookshelves, puzzles and other ‘quiet’ time activities. Quiet areas should have an area for colouring, craft projects or other activities that requires children to sit down. Play Area: This area can be adjacent to the open floor space area. Small push toys and noisy activities should have toy baskets close by in which kids can access on their own. 2. I believe in starting off with neutral colours and then adding some colour with accent pieces and accessories, which always provides a more elegant, yet playful design. By coordinate matching colours to area rugs and window treatments will pull the play area together beautifully. 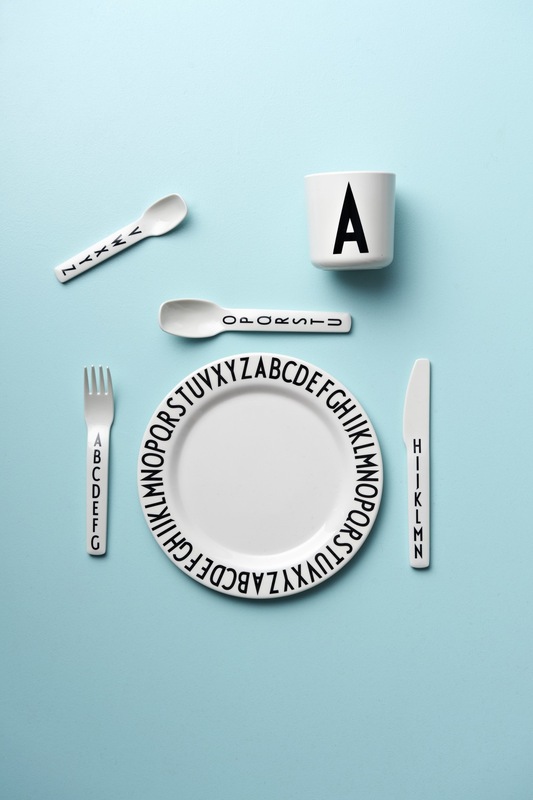 A specific theme can also be selected and designed accordingly. The walls can be painted creatively and one wall can be done in a beautiful wall paper, so many options…. 3. Sufficient storage is a must, as this will prevent the area from becoming messy easily. 4. There are so many creative design ideas, which won’t cost you an arm and a leg, and combined creatively will make a huge difference on the final room design. The colour selection and the furniture layout is also an important factor to keep in mind. Space planning is important, as this enhances the flow of the room. For instance, the beautiful black writing board shaped as a house is such a stunning piece, which adds a beautiful feature on the wall and has practical use, and not expensive to produce. Even a normal open storage box from IKEA can be transformed into a beautiful wall feature. This is so easy to do by only adding yellow washi tape around it shaped as a house. Wooden storage boxes can be made with graphic stickers with castor wheels, which is movable and practical. These type of pieces really adds something unique to a space. To add something even more special to either girl or boy’s playrooms teepee tents and the latest craze, wooden frame houses, always bring a magical element to the room. This is where the kids can just escape into their own little cocoon, to read and relax. These can be accessorised as much as you want. Garlands are an inexpensive accessory that add something playful and colourful into the room. These beautiful kitchen areas can also be used in a playroom to provide hours of pretend play. And you want to add some totally innovative items, how about an indoor swing or a wall climbing ladder (perhaps add a large cushion below for safety). Thank you so much Karen for sharing your clever tips!!! 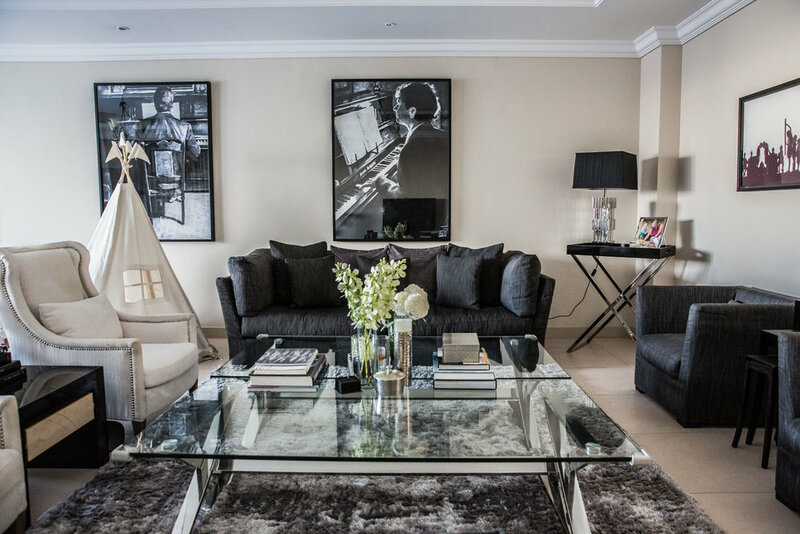 Karen is not just a specialist interior designer for children's spaces but also a photographer and an artist. Do visit her website Design K for more on her fabulous work! If you live in Dubai you will know all too well that it was bucketing down in the UAE yesterday, schools sent the children back home half way through the morning, we all endured the driving through flooded roads and chaotic traffic, as if a couple of drops did not make it bad enough normally, and we all did the Dubai thing when it rains and kept ourselves busy posting comments and pictures about the weather. Once that was out of the way, we decided it was wise to hibernate, keep a close eye on the water leaks coming through the garage roof and ... do some baking with the kids! So I decided to share this recipe that is easy, our kids love and is the only way they will eat beetroot (unknowingly) other than in 'pink' pancakes. Yes, it has chocolate in it - a 'no-no' for my kids generally but they know it is a special treat reserved for when they have friends over for a play date, and that I also used for my daughter's second birthday party, so they get it. I found a couple of recipes online that I vaguely followed and have been modifying to reduce the amount of butter, chocolate and sugar to a level to a level of compromise between what the kids they should be eating and what I think they should be eating. Needless to say, you can use the organic version of as many of these ingredients as you like - I just use organic flour, eggs and milk because they are the easiest to find. If you want to make a large batch and freeze, you can. Very handy for 'emergencies' as they will defrost nicely within an hour or so. With latex gloves on (unless you fancy pink fingers afterwards) peel and grate the beetroot. Sift the flour, baking powder and cocoa powder into a bowl. In a small bowl, whisk the eggs and milk. In a large bowl, cream the softened butter with the sugar and then add the oil. If you have an electric beater, just work all 3 together until creamy. Add into the butter mix bowl 1/3 of the flour mixture and gently fold in without mixing it too much or too long. Then add 1/3 of the egg mixture and fold in. Repeat until all the mixtures have been used up. Fold in the beetroot and stir until well combined, but again not too long as this will harden the muffin. Pour the mixture onto muffin cases and bake for 17-18 minutes. Put the muffins to cool on a cooling rack and dust with icing sugar before serving. Image used is from Give Recipe because I had forgotten to take a picture of mine straight away and they were pretty much devoured shortly after coming out of the oven! 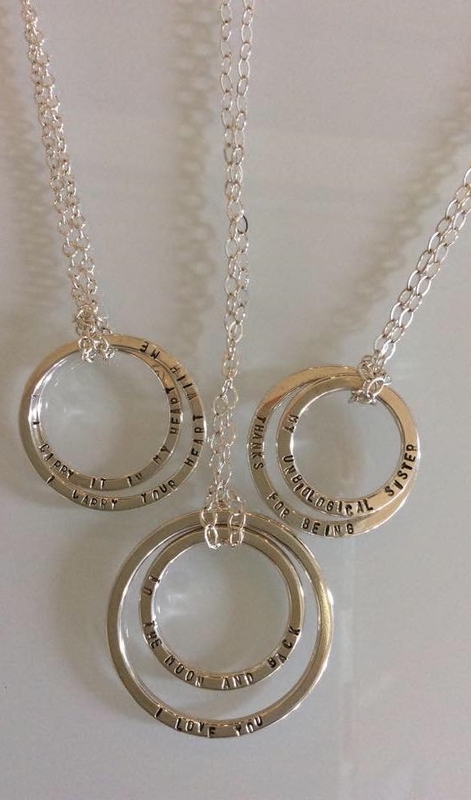 At Christmas my husband bought me (meaning I bought on his behalf) a gorgeous personalised message circle pendant with two rings, each engraved with the name and date of birth of each of our children. Up to today I have been wearing them almost on a daily basis because I am so in love with them! Where did I get them? At the Marina Souq in Dubai, from Lynda Marion Jewellery. The owner, Lynda, is a super charming South African lady who has been handcrafting jewellery for 7 years after having started as a hobby and enjoyed it so much that subsequently attended courses at Central Saint Martin’s School of Design in London. 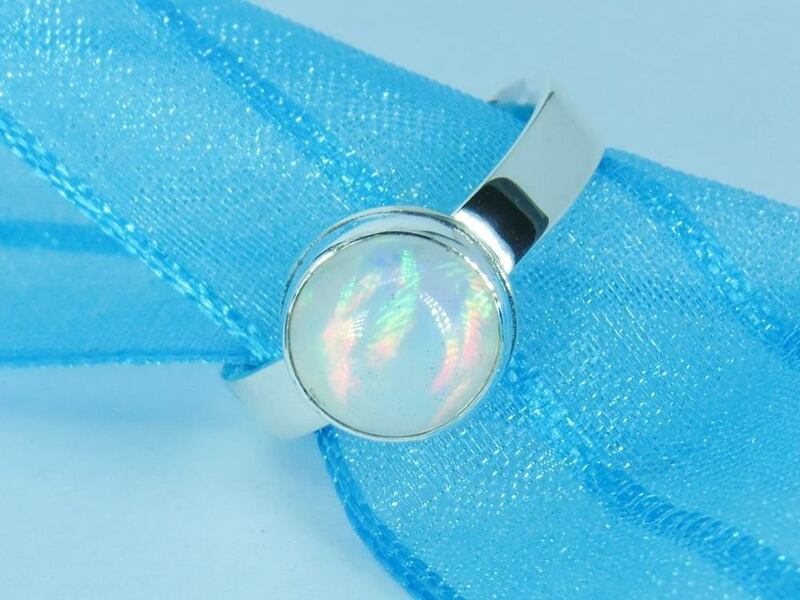 Lynda specialises in sterling silver but sometimes also uses gemstones such as amethyst or opal, or 18-carat gold in her designs. The beauty of it all is that because they are handmade, no two pieces will be the same. Living by the sea in Abu Dhabi, she draws her inspiration from the lovely sea views and the stunning sunsets she has from her home, and also the beautiful colours. Lynda loves a challenge and accepts commissions, as she loves translating her clients’ ideas into beautiful pieces of jewellery that they will wear and enjoy. Her next visit to Dubai is on 16 March for the Marina Souq at the Fishing Harbour in Umm Suqeim 1, but you can also find her once a month at the ArtE, The Makers Market in Times Square in Dubai and at the Ripe markets in Abu Dhabi. Check the Lynda Marion Jewellery Facebook page for the updates. AND, for Mother’s Day, Lynda is offering one of the Little Sybarites readers the opportunity to win one of these pendants worth AED 350 that she will then engrave with the name and date of birth of your child/children. Existing 'Likes' also qualify. Entries close at midnight on Sunday 6 March and the winner will be announced on the Little Sybarites Facebook page on Monday 7 March. March in Dubai is my favourite month of the year. Not just because of the glorious weather but also because it is jam-packed with events across the city, from sports to art, to entertainment and … FOOD (!!!). So talking to a mum at school pick-up a couple of days ago, she mentioned how she is having difficulty keeping track of all that is happening around town. And to be quite frank, so was I! So I had put together a list of ‘must do’s’ for the kids and I this month (even daddy might be allowed to join in a few too) that I was happy to share with her, and thought I would share on here as well. Probably too many to tick them all off the list, but we can only try. Apart from mummy and daddy drooling at the boats and for the umpteenth time discussing a savings plan to buy our own boat, there are tons of family fun to be had including taster sessions of a few water sports. Also, for the first time, the first F1 H2O Grand Prix of Dubai from 2 to 4 March! Take your kids to meet the designer of Bob the Builder - Curtis Jobbing - or the creator of Charlie and Lola - Lauren Child -, and afterwards have a story read out to them at the Time Out Story Corner. Open-air museum exhibiting over 60 pieces of spectacular 3D art in the making, by more than 30 artists. 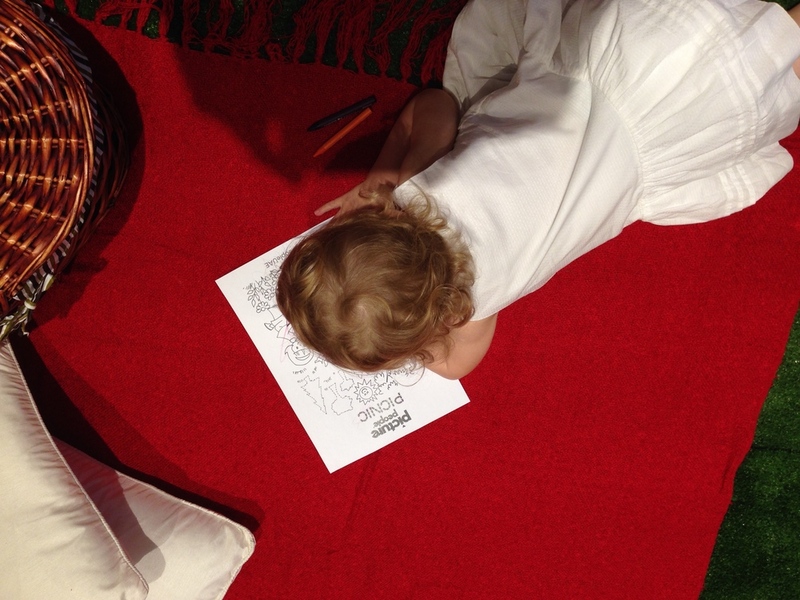 Kids corner by JamJar for the little artists to unleash their creativity between 5pm and 8pm. Little sessions of mini golf and fun with Tee + Putt Mini Golf. Indulge in BBQ, scones and jam, cold deli, sweet corner and picnic hampers while the littlies are kept busy with face painting, a bouncy castle and ballpit. Never too early to expose children to art! 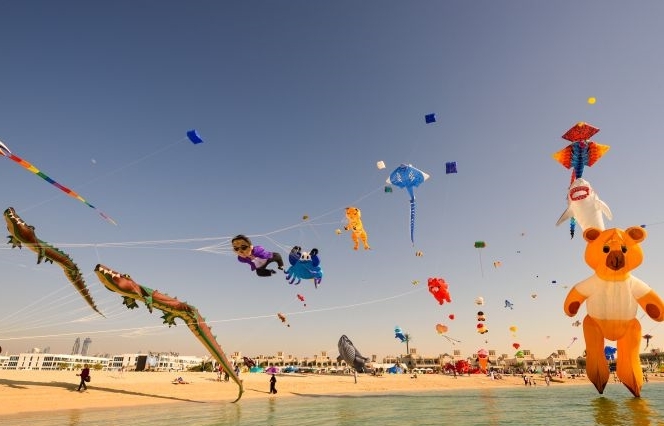 Another great excuse to spend the day at the beach but most importantly, serious fun for the kids as they are allowed to fly their own kites and can also watch the many shows. Yes, my son has been asking how many days until Easter. Because he knows what that means: Easter egg hunts and chocolate! Topped up by a performance by Magic Phil at 4:30pm and face painting. All this while mum … well … shops! Hubby and the minis will love watching the more than 320 super cool vintage cars, motorcycles and trucks lined up on display. Bring the batteries in the camera charged! Not a children’s event in the strict sense of the word but one that is attended by many kids and it is a great opportunity for them to see horses doing what they love best: racing. Nobody does it like Dubai. THE extravaganza of the year. There are so many events planned and taking place that just reading the booklet has made me dizzy. But for foodies like me, this is a must-must-must go. Like most of you know by now, it started last weekend but there are still ten more days to go. Our kids loved the Eat The World with food trucks galore at Burj Park on Saturday, and even managed to have them sitting through an entire session of Rosemary Shrager making a scrumptious chocolate cake (!). Who doesn’t love a BBQ and music? Our half-Australian children certainly do! But if you prefer to stay true to Dubai, there is also a Brunch from 12pm to 3pm. Food carts include the Popcorn Cart, Cotton Candy Cart, Pun Candy Cart and Pick n Nick Candy Carts - not necessarily a good thing in the parents’ minds but a fabulous thing in the children’s minds! Baking activities and workshops for our little people, as well a live demonstration by celebrity chefs. Children can draw on white ceramic plates their favourite food that they would like to share with less fortunate children, in order to contribute. Fabulous opportunity for our fortunate expat children to get exposure to the ‘real world out there’ while they do their bit. The closing event to Dubai’s biggest two weeks of food celebration, and an opportunity to indulge in yet more deliciousness, music and cooking workshops. Have a super fun month. Eat, Love and Be Merry! Since becoming a mum, leisure shopping (as opposed to necessity shopping, i.e. Supermarket!) has become a thing of the past. But there is one thing I indulge in on a monthly basis: the Marina Souq. They have recently moved to the Fishing Harbour behind the DOSC on Jumeirah Road so parking is always easy although it can be a short walk away (there is your bit of exercise for that morning) as it does get very busy early in the morning which is when I go, after school drop-off! Bonus is that after your girlie shopping, you can stop at the fish market and get the freshest for your dinner. Most of the vendors are regulars at the RIPE or ArtE markets too, and some have their products for sale at places like The Change Initiative. But I love that once a month (normally a Wednesday) you can find them all under one roof - quite literally: one large marquee that gets buzzing with ladies and their bubbas or BFFs, doing what we know how to do best! 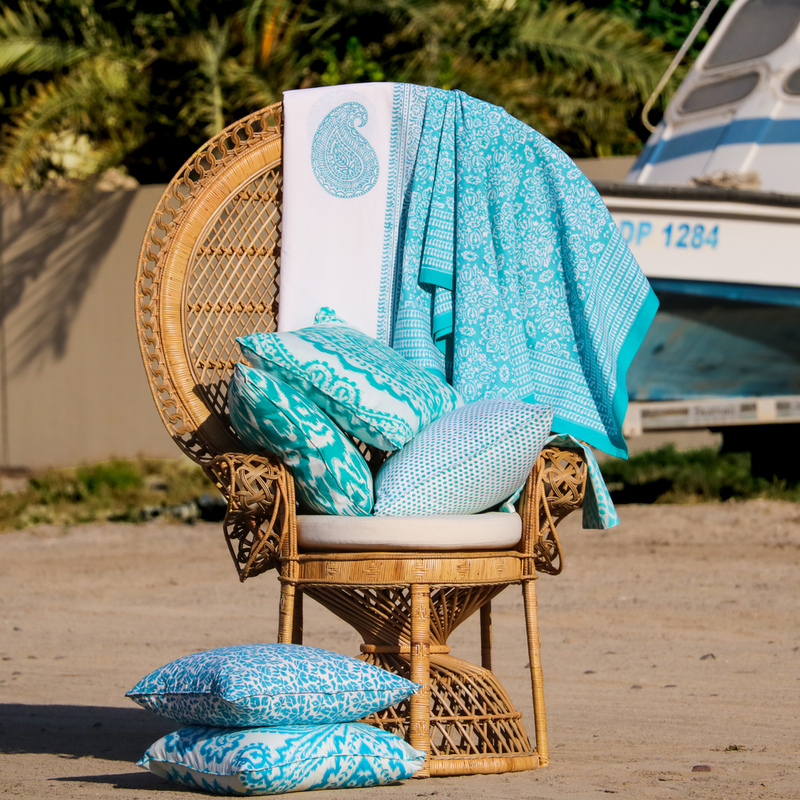 Chic beachwear in all its forms, selected by 2 Australian birds, as the name rightly says: from floaty dresses and kaftans for that island holiday you can't wait till, to brightly coloured Turkish towels, and from beach jewellery to seriously handsome boho beach bags. This stand gets SO busy you need to get there early, otherwise it is almost impossible to get close enough to have a good look. Clare Napper’s stand does not go unnoticed. When I walked past it, I had to look at the posters twice – they did make me chuckle! They are really quirky and hilarious vintage style travel posters that depict all the Dubai expat clichés, such as 'Friday Brunch', or 'Maids - how will we live without them?'. If you have a sense of humour, this could be a great addition to your walls. Clare keeps on adding new collections, so keep an eye out for the upcoming one too! 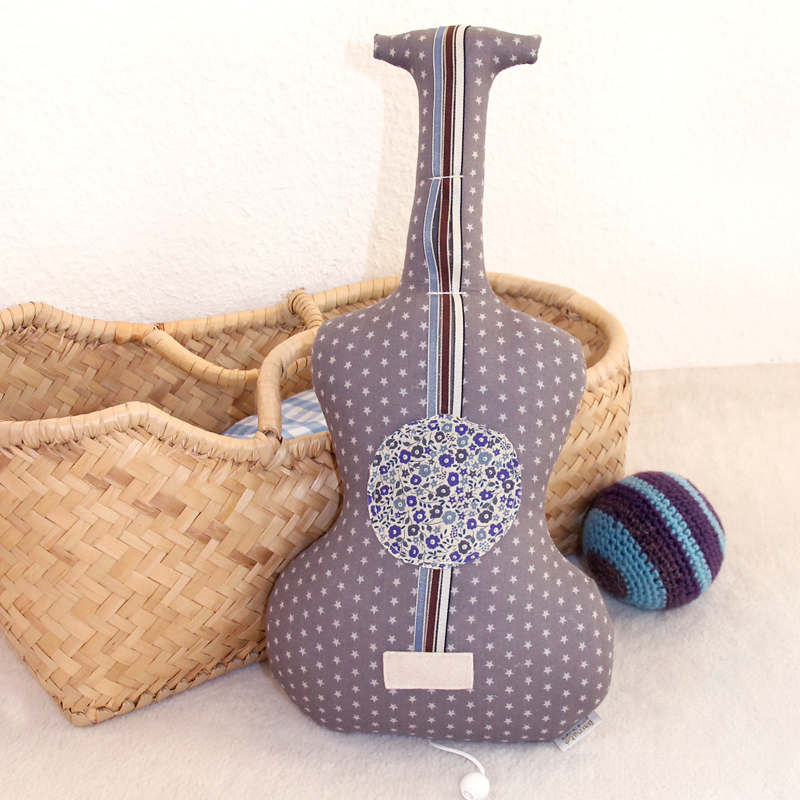 Kathrin, the clever mind behind Kariba Arts, loves all things recycled and upcycled. So she walks the beaches of the UAE collecting pieces of driftwood to later give them a new life with her beautiful organic, one-of-a-kind creations. From Christmas decorations (which looked divine) to funky signage for the house or candle holders. All that stuff you thought only belonged to beach houses on Pinterest! Who does not know Shenouk? You may have seen her gorgeous Jaipur artisanal block printed fabrics at friends’ garden tables or benches. The lady behind these gorgeous table linens, cushions, bedquilts and blankets in the most delicate and intricate designs is Sherine Freeth. And you can find her at the Marina Souq every second Wednesday of the month with new goodies every time. I want them all, I want them now! If you are interested in learning all about blockprinting, she is so passionate about them that explains it quite in detail in her website. Think gorgeous crisp linen, hemstitch, tassels, or embroidery in motifs of-the-moment (flamingoes, pineapples), funny (camel) or even beachy (coral). 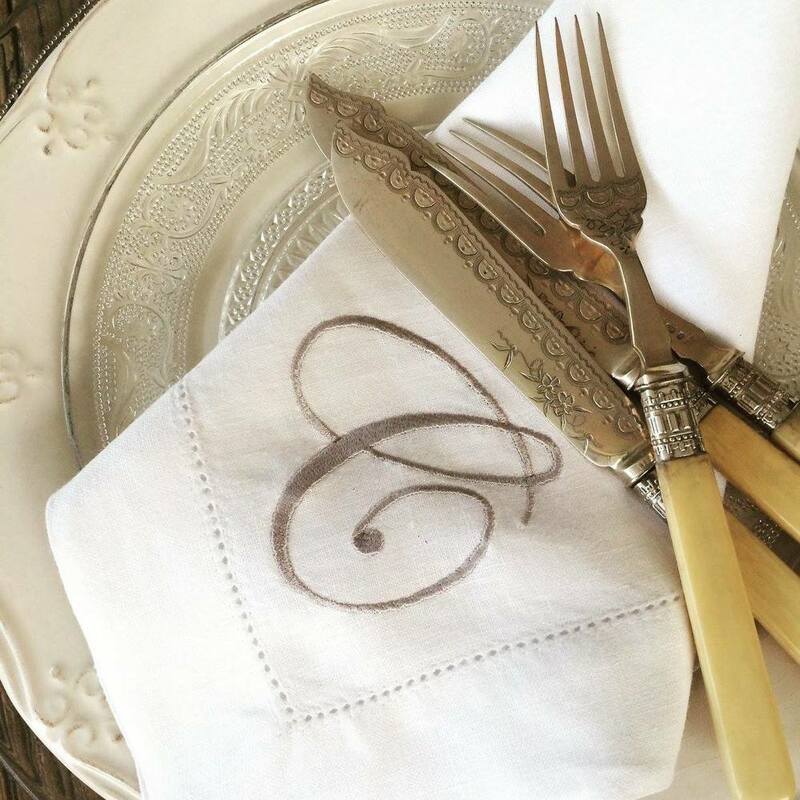 Think beautiful tea towels, lavender sachets, or monogrammed napkins. Think bespoke. Think ultra elegant. 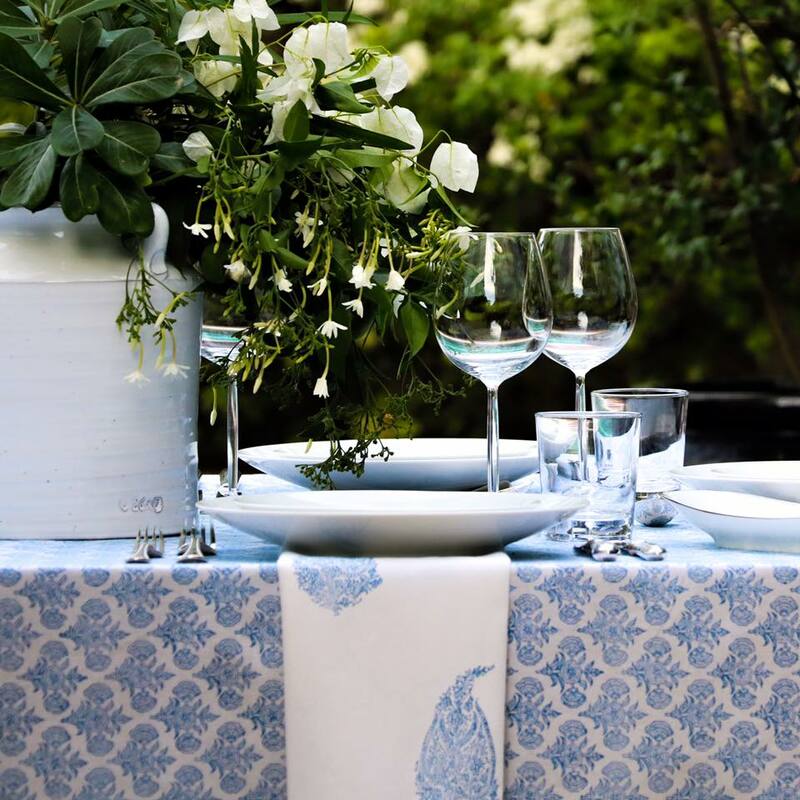 It is not for nothing that The Linen Souk is being used for VIP dinners at some of the most sophisticated hotels in Dubai. 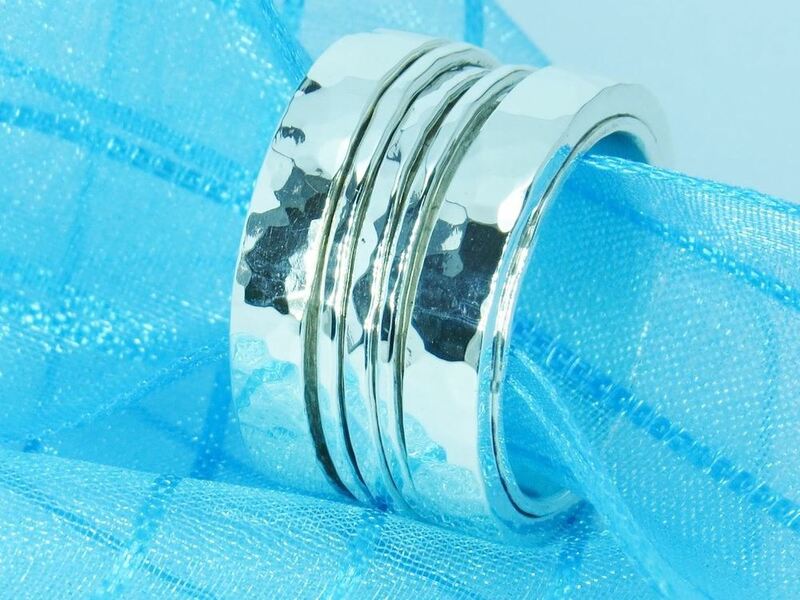 It also makes a lovely traditional and thoughtful wedding gift, or (why not?!?) a special treat for yourself and your guests at your dinner parties. Tribe Dubai is one of those heavenly places where I could just spend hours, going ‘ohhh … ahhh … look at that …’. Are you after the hippest items from the 60s and 70s that have made a come back? Do you want to recreate the calm look of a beachside boutique hotel? Or are you all for supporting fair trade? All of that is Tribe Dubai. They describe themselves as ‘global-chic bohemian with an essence of coastal elegance’, and, as much as I tried, I simply could not find a way to put it better. 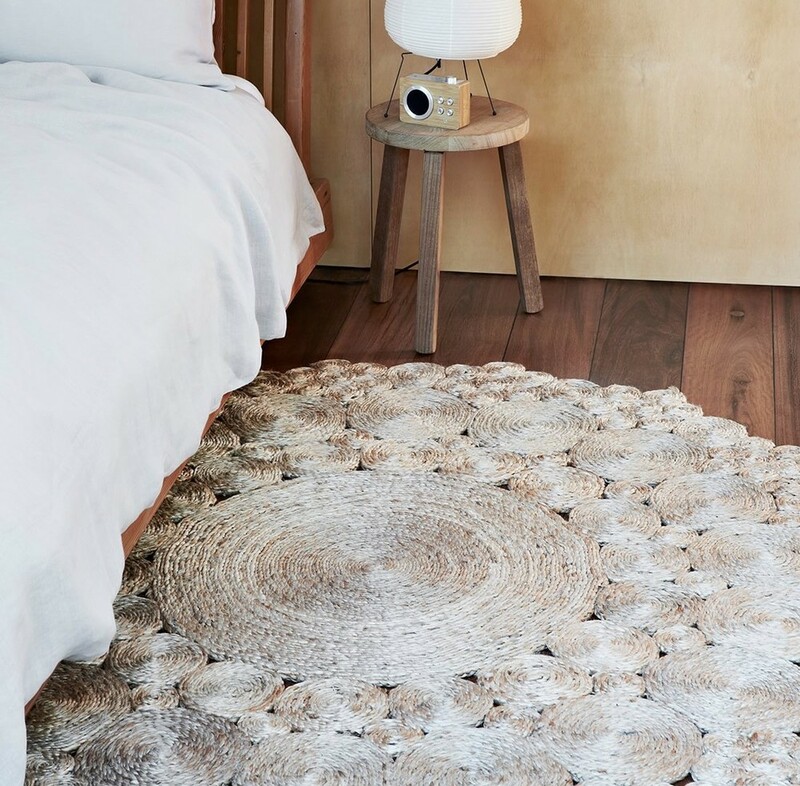 We adore the Malawi chair, the Armadillo & Co rugs, the Byron Bay hanging chair, and the Mud chandelier, all handcrafted by artisans. If you miss the Marina Souq, they have a showroom with all their goodies on display on 4th street in Al Quoz, above the Lexus showroom next to the Dubai Garden Centre. They are open in the mornings but afternoon visits can be arranged by appointment. OK, the last two for the kiddies. Biddoo is an online store that has regular presence at the Marina Souq, and has become my new favourite stop for birthday gifts and travel toys. They carry just 4 brands (Djeco, KEK Masterdam, seedling, and oskar & ellen), but the choice is enormous! 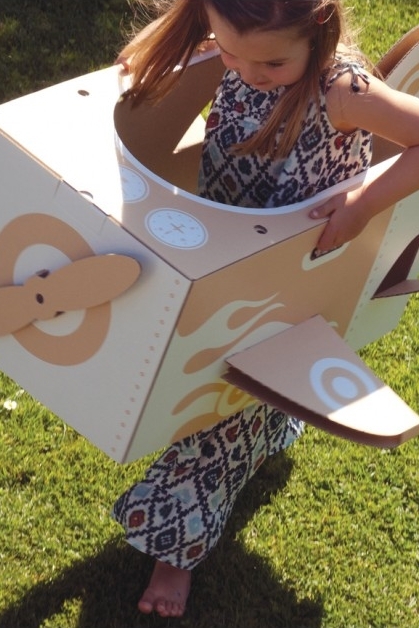 With the never ending selection of educational and pretend play toys, all made of cardboard or wood, I know I will find something suitable for every occasion without having to go traipsing the malls or Amazon. Check out the chalkboard wall stickers too! It never struck me how short I am (!) until I met Maren Gerber, statuesque and elegant by nature. Her impeccable taste comes through in all of her carefully curated selection of 40 brands from Europe and Downunder that just ooze cool. You name it, she has it (especially if you are looking at putting together one of those gorgeous monochromatic genre neutral rooms): books, bedding, lamps, rugs, wall stickers and decals, funky toys, wooden toys, cardboard toys, tableware, playhouses, tents and teepees, and the list goes on; but always high quality, stylish, organic and long lasting products. We particularly love the 'Today I will be my own Superhero' quote decal by Wondermade, and the Jupiduu wooden kids slide that has got the seal of approval by none other than young Prince George, and ... can be gold plated on request (of course!). 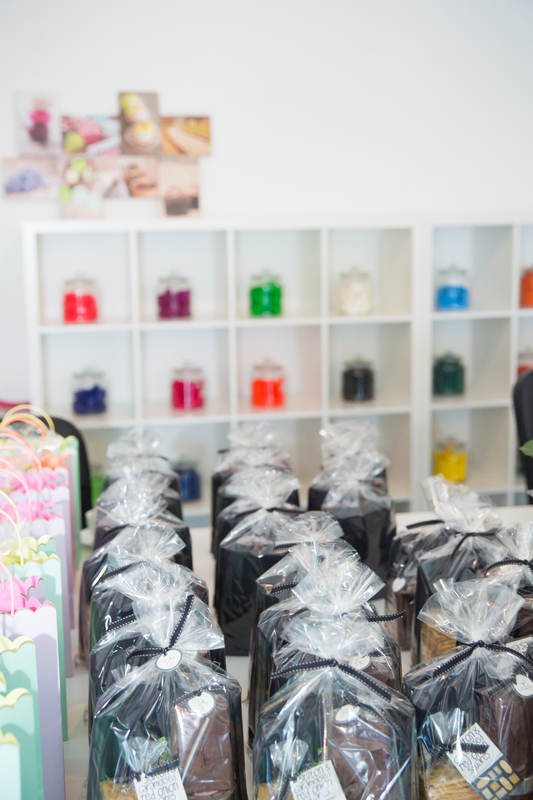 As I said, these are just a few, but you will find other fabulous brands like Alma Fenicia, Birdsn'Bees Fairy Lights, Caramel & Sun, Heidesign, Jules & Juliette, Keen Bags, La Plage Dubai, Pure Candles Dubai, Twins Dubai amongst many others. Oh, and Baker & Spice have a pop-up restaurant to keep the energy going - bonus!!! If you have not been yet, try and make it one morning now that the weather is so perfect, or an after-work shopping treat. The next editions are on 10 February, 27 February (special Saturday edition from 9am to 3pm), 16 March, 20 April, 11 May, 1 June, 15 June, from 8am to 9pm in the marquee at the Fishing Harbour in Umm Suqeim 1. For directions, go to their Facebook page here.